Traditionally used to show stops along a bus route, bus roll prints use playful fonts in different sizes to display a group of words. Framed Veruca Salt bus roll art offers a great way to showcase your favorite things. Since framed bus rolls are more simplistic and center around words as a form of art, you can use our 60+ frame options and different mat colors to really make your framed word art pop! 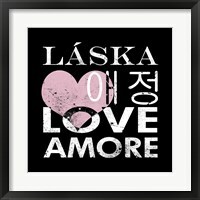 Framed in-house per order, we guarantee you will be satisfied with this framed Love Square II bus roll.